Coty Inc has chosen Swaven’s shoppable technology for Escada-fragrances website. The POP (Point Of Purchase) solution serves Escada brand audiences today in Germany, France, Spain, Portugal and in the US. The multinational beauty company Coty has already adopted Swaven’s POP for several other brands too such as Lancaster, Chloé, Hugo Boss, Bourjois and OPI. And the group has deployed the solution for multiple touch points: website, social media, display banners and videos. As part of Coty’s luxury fragrance brands, Escada will now also benefit from the same brand commerce service and its advanced ‘where to buy’ features. 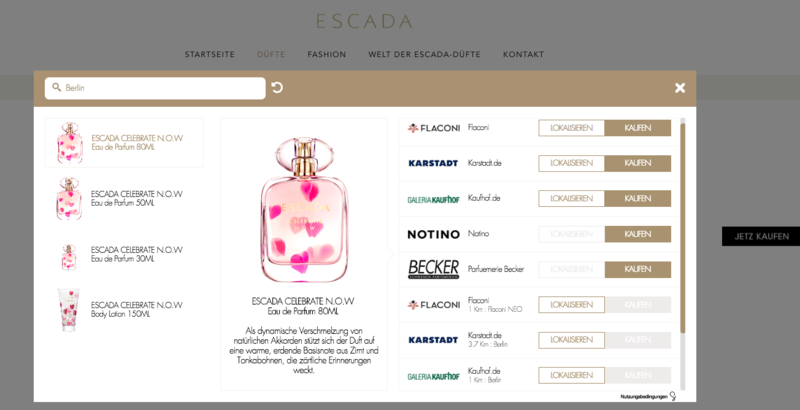 While visitors are browsing the Escada-fragrances product pages, a ‘buy button’ appears automatically. The button stays always visible, even when scrolling down the page. When clicking on the button, a widget opens. It displays a product description, an image and a list of online and offline retailers where it is available for purchase. This way the visitors can discover anytime, where to buy their desired fragrances. The solution geolocates the user and suggests only relevant retailers with available stock. A second click redirects the user to an online shop of his/her choice to finalise purchase. Or shows an itinerary to the selected physical store. Coty allows consumers a smooth path to purchase on Escada fragrances website with Swaven’s POP solution. Thanks to Swaven’s customisation options, brands can choose to present several products in a vertical carrousel within the same widget. This is useful for fragrance brands like Escada that have several variations and size formats of the same perfume. The user can easily browse different options. The solution automatically updates the description, image and the online and offline retailers for each choice. Swaven’s POP solution accelerates purchase and drives qualified leads online and offline to boost sales. But that’s only half of the benefit for brands using it. The solution also tracks the shopper journeys from acquisition channels to finalised purchases. The collected data and Swaven’s analytics tools allow brands and groups like COTY to evaluate their marketing efficiency and the business impact of their activities throughout the purchase funnel. It also allows them to better understand their customer preferences. Thanks to a clearer visibility and concrete KPIs on the outcome of marketing activities, it is easier for the brands to optimise their efforts to increase performance. This is essential because no marketing campaign can be planned today without the notion of ROI. If your brand needs a boost it digital marketing performance, get in touch with the Swaven team.